Do you ever feel like there just aren't enough hours in the day to squeeze in all you have to do, plus prepare, cook, and lovingly present a home-cooked meal to your family? While I can't add sand to the hourglass of your day, I can share a secret weapon recipe you need in your recipe box (aka: foodie pinboard)! 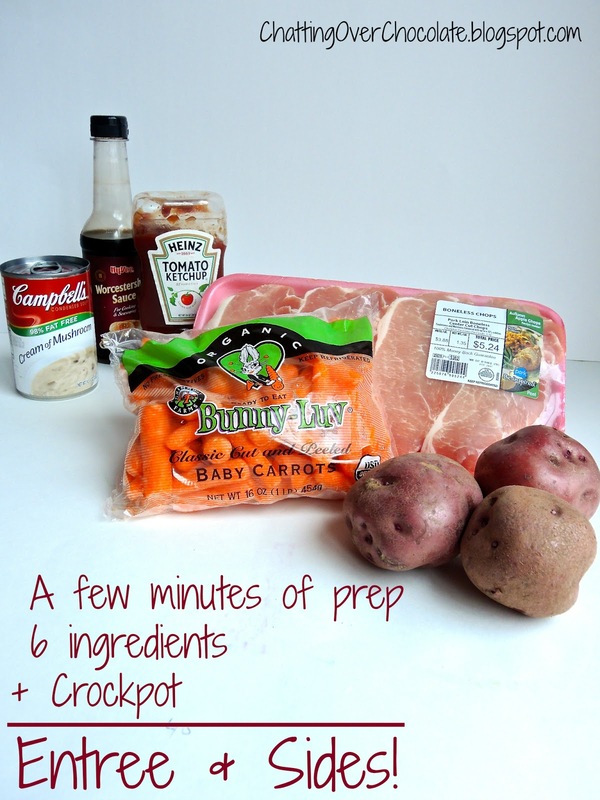 Pin, then jot these 6 ingredients on your next shopping list ... your taste buds & your family will thank you later! This meal is fancy enough for a Sunday dinner, yet simple enough to enjoy any day of the week! 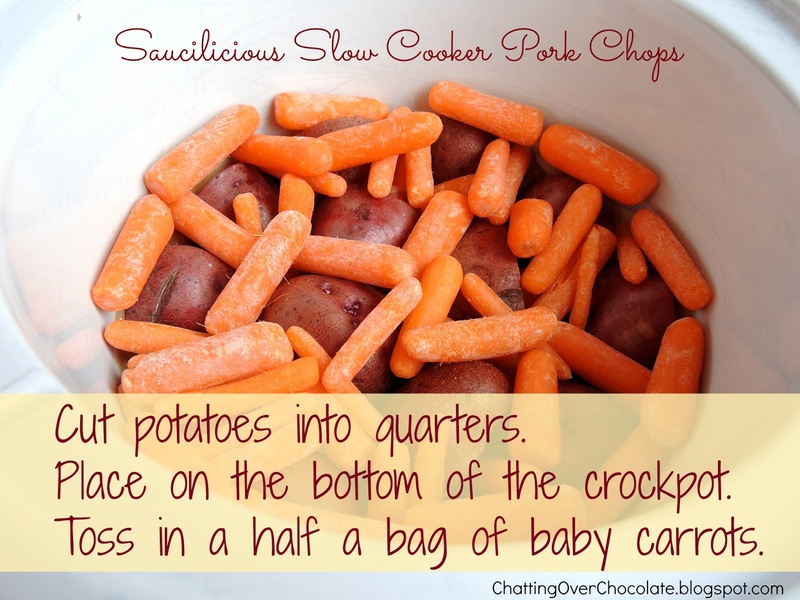 Place potatoes and baby carrots in slow cooker. Add the pork chops on top of veggies. 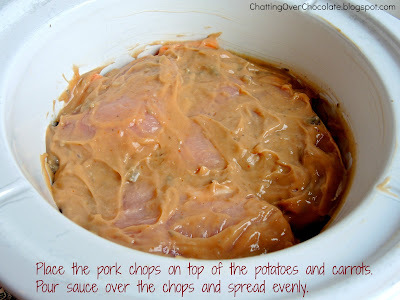 Mix the sauce ingredients, pour and spread evenly over pork chops. Oh so easy! Oh so good! ... ENJOY! Don't miss a thing at Chatting Over Chocolate! This sounds delicious, Brenda! I will definitely be pinning this to try soon. 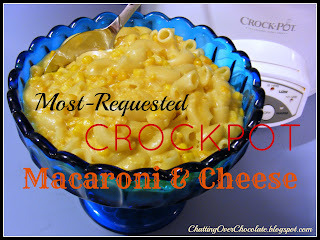 You should link it up over at the Crock-pot Recipe Link Party I posted yesterday. I know there are others who would love this time-saving delicious all in one dinner. Thanks for sharing! My kind of dinner, easy and ready when I need it. Because you are right, there aren't enough hours in the day! 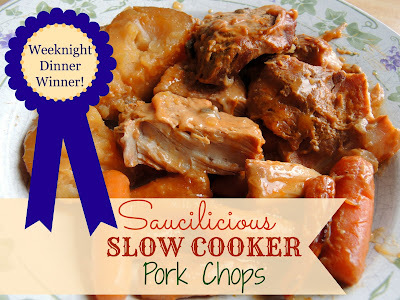 I love easy crock pot recipes and this one looks delicious! I can't wait to give it a try! Would you consider sharing this recipe and any others you may have over at my Pinterest Party? 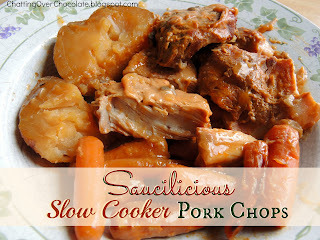 Love the name of this recipe!!! :) We will need to give this a try next time we have pork chops in the house. These look great and easy! I'm trying these soon!! loved looking through your blog...newest follower here! Oh goodness my dear that looks fab. I feel like not enough hours almost every day .. lol. The name is perfect :). I am so all over this for this week! Tuesdays are the crazy day around here where my crockpot gets the most use! Thanks for visiting, commenting, and pinning!! So great to hear from you, Marcy! Yum! Sounds delicious! Thanks for sharing at Sweet & Savory Saturdays #9. This is a keeper. It sounds wonderful and fast. That's the key word "FAST". Thank you loads for sharing this. I want to try this. I agree ... FAST is fabulous!! Hope you try and enjoy soon, Sue! Thanks for the sweet comment! Sounds saucilious! Love a sauce with pork chops. Thanks for sharing on Thursdays Treasures. Yum! This looks sooo good! 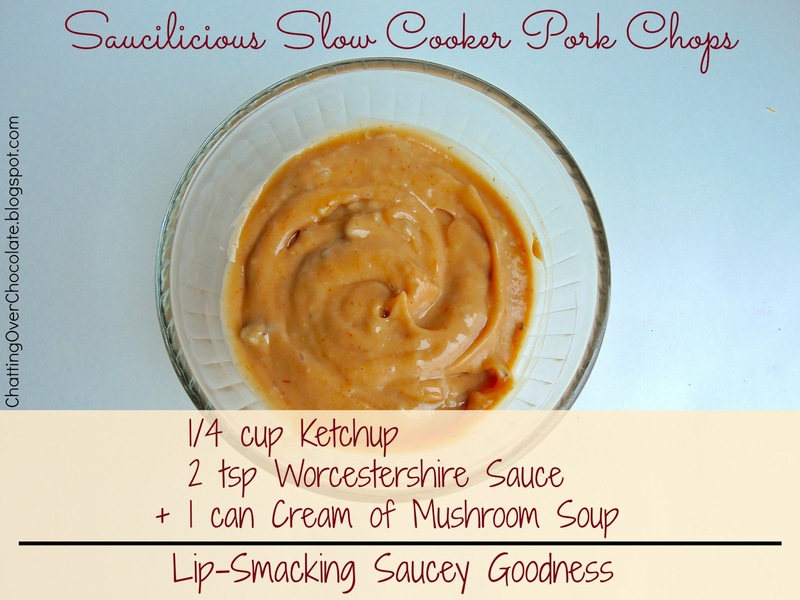 And I bet the sauce is killer :) Thanks so much for sharing with us at Weekend Wonders! Hope you're enjoying your week so far! This looks so yummy and the best part----its made in the crockpot! Yum! Following you via blog lovin! I would be thrilled to have you share this at my link party! This looks so tasty! I do have a question...I am allergic to mushrooms so is there something I can substitute for the cream of mushroom soup? So sorry to hear that it didn't turn out for ya! I've never had that problem with this recipe before. Did you cook it longer or at a higher temp? Can you use frozen pork chops or do they have to be thawed? What temperature do you set it at? I was so disappointed with this recipe. It smelled wonderful, but the pork chops were dry, the sauce was bland, and not even a mountain of barbecue sauce could fix it. I apologized at length to my family for serving it, and promised to never make it again. My guess is that you cooked it too long or at a higher temp. Overcooking does result in dryness. As you can see in the photo above they should not come out dry. I'm surprised to hear you found the sauce to be bland. Best wishes in finding a recipe that better suits your taste.